Dr Mukesh Batra, India’s most famous homeopath and founder of the world’s largest chain of homeopathy clinics, shares his professional expertise to help you diagnose and find answers for common and not-so-common ailments. Categories: Health and Medicine, Homoeopathy, Mind, Body, Spirit. Tags: homeopathy, 9788179928943, Health and well-being, Healthy living, Jaico. A simple, user-friendly practical guide to holistic health, Healing with Homeopathy deals deftly with over 60 illnesses arranged alphabetically from A-Z. 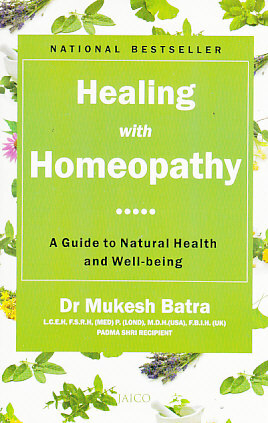 Writing simply and clearly, Dr Batra explains each condition, its symptoms and variations and what homeopathic remedy is likely to work best. The book includes useful dos and don’ts as well as illustrative case studies, culled from over 40 years of medical practice. An expert introduction to homeopathy and its application, Healing with Homeopathy arms you with the knowledge and confidence to recognize and deal with a variety of health issues in the comfort of your own home. Put simply, the book is an invaluable tool for anyone who wants to take charge and manage their health safely, effectively and without the fear of side-effects.